Through the Aquarium Glass: The Eye of a Kraken is probably twice as big! A few days ago, NPR reported that a huge eye had washed up on Pompano Beach (very close to one of my hometowns: Plantation) and asked readers to guess what type of creature might have been the original owner of the giant peeper. Turns out- it's probably a female swordfish. Scientists suggest that the bone around the eye suggest it is a fish (whale's actually have pretty small eyes). The largest swordfish ever caught was 612 pounds. 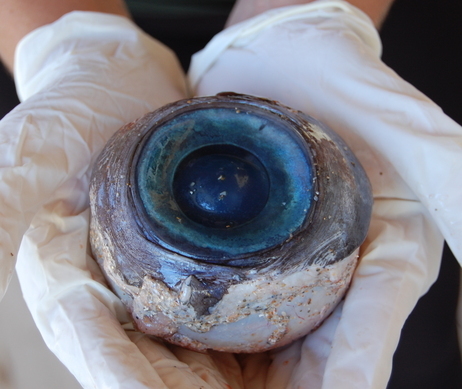 Interestingly, it also appears that the eye was removed by a professional: there are tool marks on the bone, suggesting that a fisherman tossed the eye back into the water after removing it from his/her catch. So- not extraterrestrial or inexplicable. But still, pretty cool. I'm guessing the Kraken eye is way bigger. Just saying.